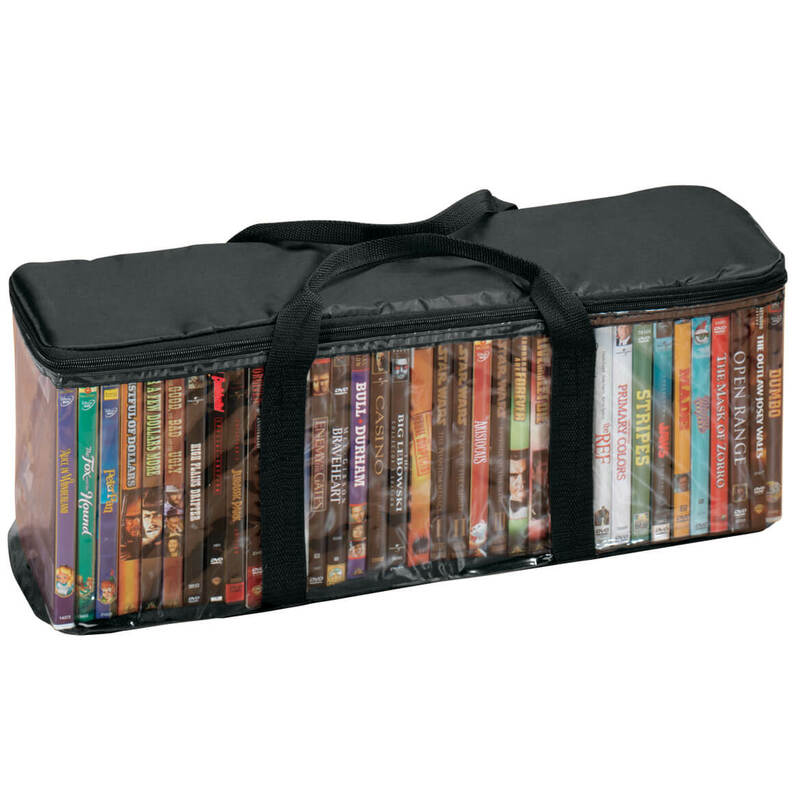 Add 2 Media Storage Cases to Cart, Get $1 Off each! Very useful for storing records and keep them dustfree. It is excellent for its intended purpose, which is exactly how it is being used. It enables the user to keep his or her old LPs in one place and visible. It remains to be seen if the material and construction hold up over time. The weight of the plastic material and zipper construction are not meant for vigorous handling or the rigors of commercial airline travel. My six will never leave my abode. 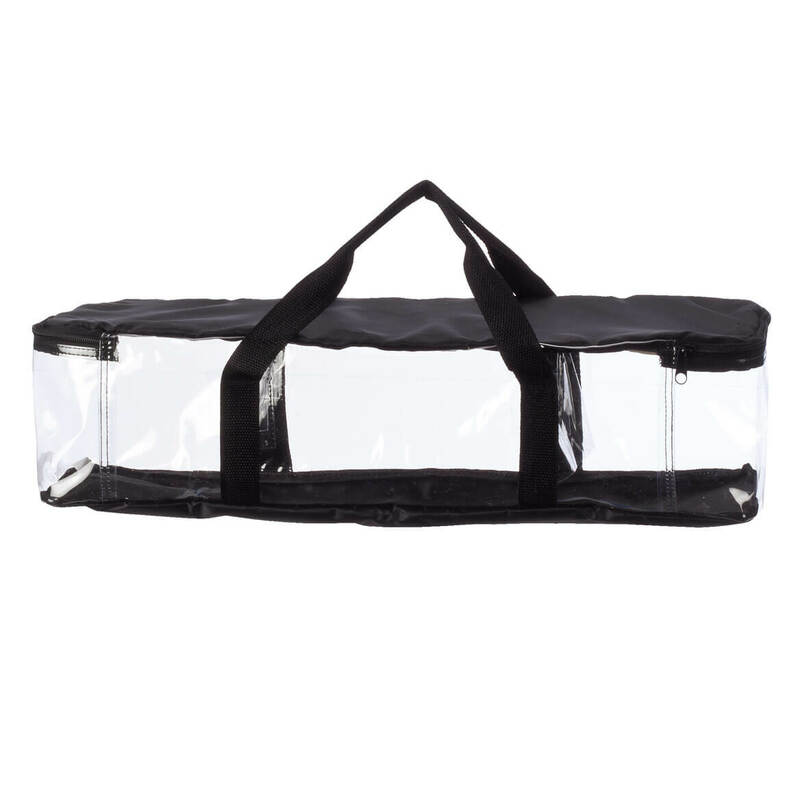 This holds numerous LP's, and straps wrap around under vinyl for more support. However, do not pick up with one hand...will tear vinyl. I did by mistake. I have over 200 record albums and wanted a convenient way to store and protect them. I found the vintage record album protectors in the Walter Drake website and purchased some. I love them. They come 3 in a pack and each one holds 28 albums. I bought 2 packs. I was able to organize my albums and store them knowing that they would be protected from the elements. The protectors are easy to handle as they have sturdy handles. I would recommend these vinyl carrying cases to everyone, as a matter of fact I will be ordering 2 more sets. I recently found out the value of my vinyl records. Now they are protected to maintain their value. My albums are treasures from the past. It's nice to know they will last longer with this product. I have purchased five sets of these storage cases. They are good quality including the zippers. They each hold at least 29 record albums. They are easy to see through and to use. I would recommend them to anyone wanting to protect their albums. I ordered these and used them for a lot of old albums we had but didn't have enough of them so ordered more. I may still order more of them yet. They work great. These old vinyl albums are seldom played and these cases are being used to keep the dust off and store them inside some cabinets and won't be toted around and moved repeatedly. For my purposes, they should last a very long time. I hope these remain in stock for many years to come! Happy to find storage bag for old vinyl records to store in basement area. My oldies but goodies are saved!!! I am in the process of downsizing from a 4 bedroom house to a 2 bedroom house. Over the years I have accumulated a great many albums. Many of these hold a ton of memories. When I didn't know how to pack the albums for fear of breaking them I found the perfect solution-the vinyl record storage unit. It holds albums very nicely. The handles are sturdy and the see thru made it really nice. The nice thing is there is more than one! I use them to store my scrapbooking paper in. 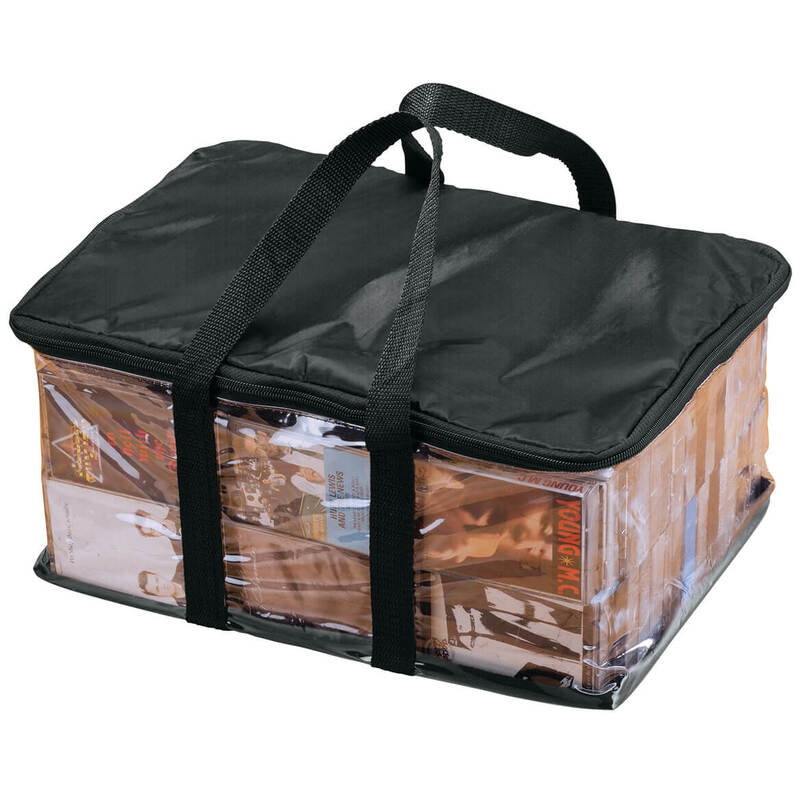 I have over 150 vinyl recod albums, and this product makes it much easier to transport them and I can sort them by artists in different bags. Most of our records are safe. We still play a few sometimes. They are also easier to carry. I love the carrying cases. makes it easier to carry the albums and protect them from dust. I need to order more. PRODUCT IS DURABLE AND PRACTICAL. WILL BE ORDERING MORE AND TELLING FRIENDS. Good product. I bought a second set. Great protection from water and moisture which I had in my basement this spring. Easier to see items inside and takes up less room than a cardboard box. Haven't used these yet, but purchased them to store old LPs that belonged to me as a youngster, as well as those that belonged to my parents. They don't appear to be airtight and/or waterproof, and I wouldn't depend upon them to protect from or prevent damage by same, but probably protect fairly well from dust. Also, they allow for upright storage, which is the best way to store albums. Storage in a plain cardboard box requires both hands to move; the carrying handles on these are a bonus, enabling one to carry more in one trip. I was so glad to find these since vinyl records are such a thing of the past. I ordered 2 sets of these and am back to order more of them. I hope they will stay in stock for many years to come. They fit the LP 33 1/3 albums perfectly and hold more than the description states they will. Of course only time will show how well they will last but since mine are just to keep to protect them from dust and not to be toting them around with they should hold up well. Thank you Miles Kimball for continuing to carry these! Put multiple albums by the same artist/orchestra next to each other. Will be much easier and faster to find the one I want. Freed up some space in the corner where the boxes were sitting before. I use these bags for scrapbooks. Glad to have found this! Have those vinyl's that you find hard to store safely. This is the item for you. 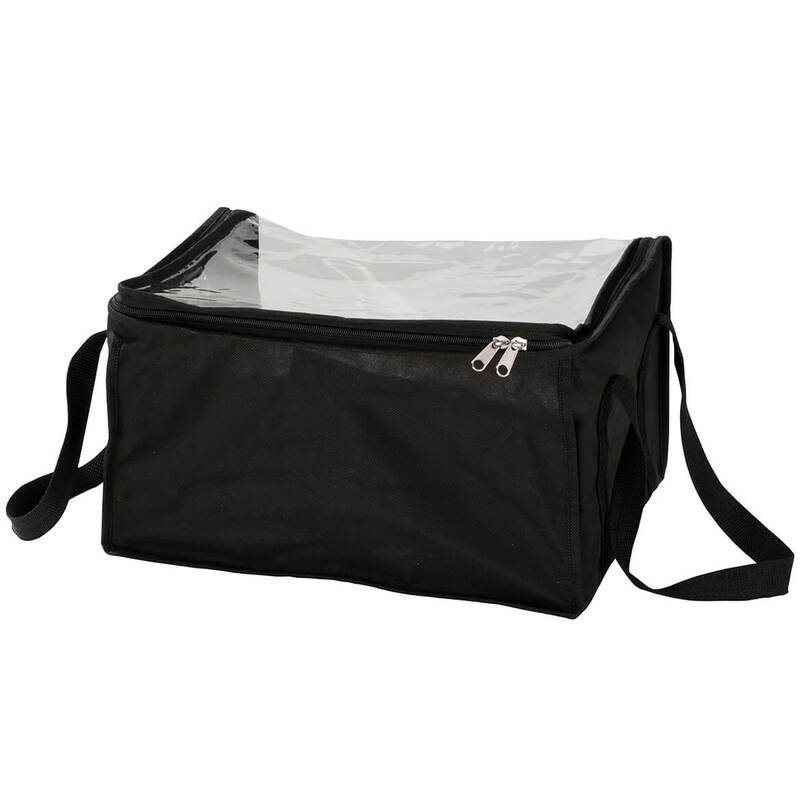 This strong plastic container, with handles, holds several record so to make them easy to move around if needed. So glad I found this! Thats why I need them to protect vinyl from warping. Like I stated before I collect old albums so I would want to keep them safe as possible. I used them to store my albums. I already have several of these and they have worked out well for my vinyl record collection. As a child in the 60s I own many record albums, as did my mother. My children want them and these plastic cases will protect them and make them easier to transport. I liked the design--looks sturdy. Will be using to hold yarn. I purchased a set of these a few months ago and I love them. I have over 500 albums that I don't want to get rid of. These storage and carrying cases are a God send. I can keep them all together neatly and store them away. They don't take up a lot of space and it keeps my albums dust free. I just ordered 3 more sets. To keep all my old vinyl albums dust free. I need to store away old but workable albums. Because I have a collection of albums that I want to preserve. I am getting ready to move and trying to organize items I want to take with me. getting ready to organize my collection. I have several vinyl records that I have not been able to find in cd, so I want to be able to save them. I chose this item for my complete set of San Diego County's 1970's "HOME GROWN" albums that I gave to my son. I have a lot of old records. Some are in an old drawer, some in a magazine rack. 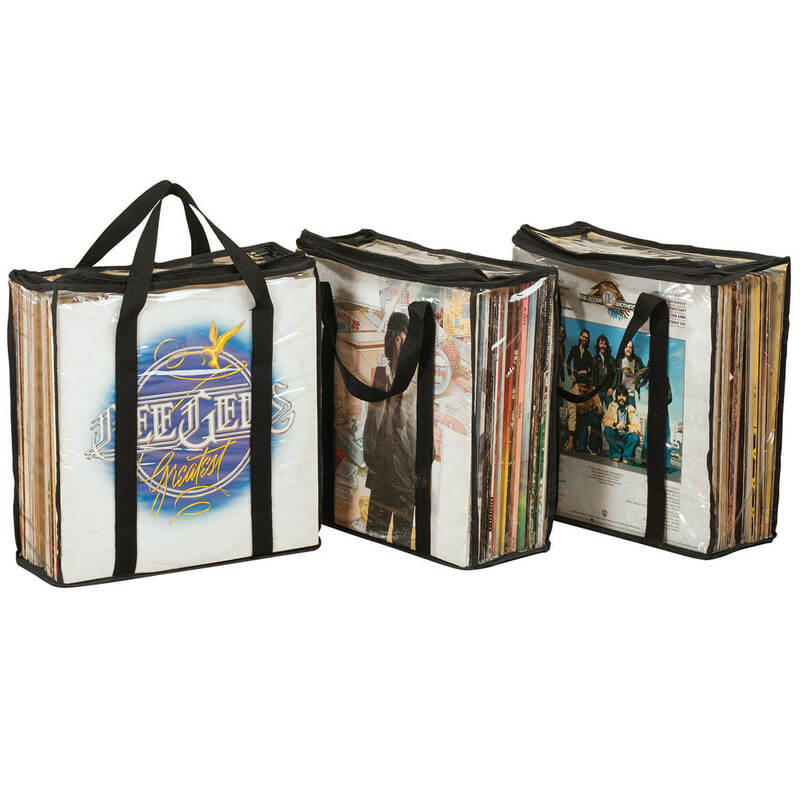 The vinyl carrying cases protect the record and their covers from further damage. We have about 200 LPs that need to be packaged up and stored. This seemed to the most practical way of accomplishing this project. To organize and store my albums. Don't necessarily have to store vinyls in this, can store toys, games, scarfs, hats, gloves, utensils, etc. Old records in basement need a new home. I already have this item. I find it to be durable, handy and reliable. I also like the fact that it comes 3 in a pack. Someone in my family collects old records and this looks like a goo way to store them. I have old records and this would be great! We have old record albums. In cleaning out a closet, we decided that we needed to protect the records. The price was very motivating. to make my collection mobile. To organize and preserve collection. Easy for dusting. Already packed for moving. I have over 500 vinyl albums that I need storage for. 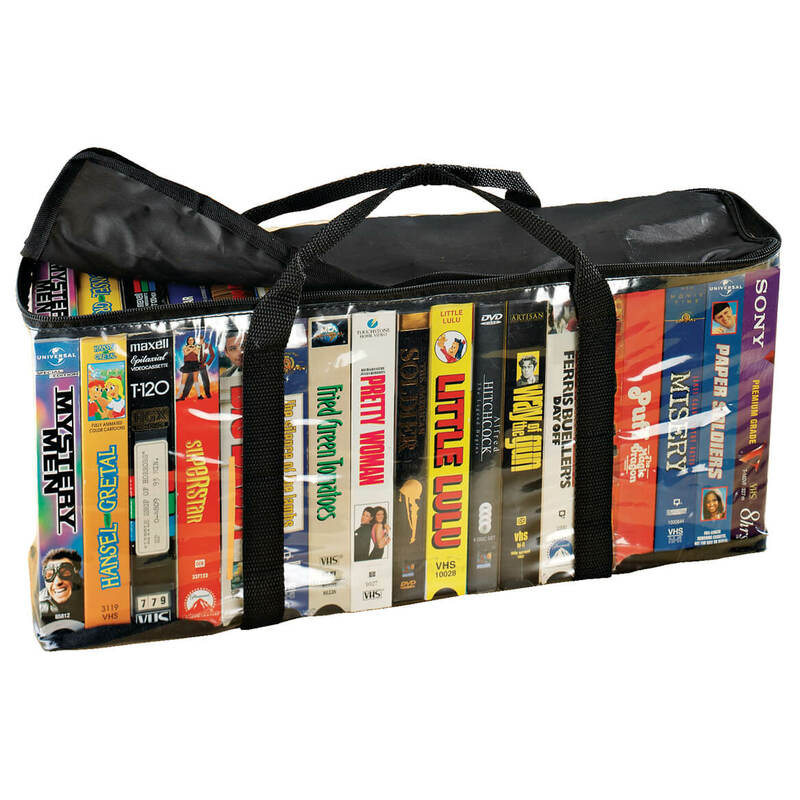 With this convenient carrying case that holds up to 28 albums I can order 3 and take care of my needs. Simplicity of storage and protection of albums. Need a placevto store lps. needed this for my record collection. works very well! Have purchased these before and like them. Needed another set for the rest of the records. Carrying case helps my husband preserve his records. Cleaning out my Mother's house. She must have well over 100 vinyl records. I need to store them and research to see what they are worth. Bought a set earlier. But needed more. what is meant by "this set of 3 plastic record album protectors"? Are they the same as a vinyl record carrying case? BEST ANSWER: Thank you for your question. Each case is 13" x 13" x 5". We hope this information will be of help to you. Yes, it is... I have 6 of them.